Presented as an alternative to synthetic dietary supplements, all natural multi vitamins and minerals are made from whole foods. Which is right for you? Multivitamins are one-a-day supplements intended to help people meet their Daily Value (DV) of essential vitamins and minerals. On the market, there are literally hundreds of these supplements to choose from, each containing a different composition. Most contain at least 10 minerals and vitamins, with a claim that 100% of the Daily Value is collectively being met. Studies have shown however that such claims are not always true, with verbiage sometimes obscuring what's missing. Whether or not multivitamins can prevent colds and other infections remains to be seen. The thinking is that the body requires certain nutrients and if individuals cannot get them from food, then perhaps a supplement can help. Not all multivitamins are created equal. This is further the case when discussion turns to synthetic vs. all natural multi vitamins and minerals. Proponents of the latter argue that supplements made from whole foods are preferable, as they provide many of the natural nutrients lost in the laboratory. Most vitamins on the market today are manufactured by pharmaceutical companies, which have developed ways of synthesizing vitamin parts in a lab environment. These synthetic, chemical compounds are used to create vitamins in concentrated form: as tablets, capsules, or liquid. While the Daily Value for included micronutrients may be met, there is an argument that synthetic versions are incomplete and thus, less effective. For example, vitamin A in synthetic multivitamins is often labeled as being from "beta-carotene." Beta-carotene is a beneficial antioxidant, but it's also only one part of the carotenoid family. In whole-food supplements, all carotenoids are preserved. The best approach to getting the full complement of nutrients remains eating a balanced diet of whole grains, fruits and vegetables, low-fat dairy, and lean meat or poultry. The goal is to provide the body with a well-rounded supply of food, one that isn't deficient in any respect. The same logic is behind the multivitamin, as it aims to supplement the body with anything it may be lacking, such as the vitamin B complex, folic acid, or iron. Now consider a supplement that provides this balance and is also all natural. Multi vitamins and minerals made from whole foods claims this very combination. On the market, synthetic vitamins are far more available than all-natural dietary supplements. 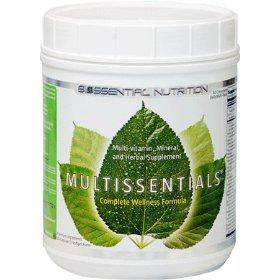 In fact, the most doctor-recommended multivitamin of all is Centrum, which is made from synthetic ingredients. Clearly, there are two sides to the argument. Many claim that synthetic vitamins are just as effective as all-natural supplements, while others argue that what is lost during the lab-creation process is too great to ignore. With hundreds of multivitamins on the market, where do you begin? Name-brand formulas, such as Centrum, One-A-Day, and Flinstones Vitamins, are a good place to start. Read their labels and consult your physician. Does anything on the label concern you? When comparing synthetic and all-natural vitamins, look for foods listed in the ingredients. For instance, vitamin A. If the source given is fish oils or lemon grass, the vitamin is natural. If the source given is acetate or palmitate, it is synthetic. Multivitamins exist because humans need to get a balanced supply of micronutrients. Since food can't always do the job alone, a supplement is sometimes needed. But which do you invest your health in: synthetic or all natural?The following websites offer more food for thought on multivitamins, their pros and cons. While it may not result in an answer, it's always best to be well-informed before making any decision -- especially when it comes to your health. UC Berkeley: A Wellness Guide to Dietary Supplements with an introduction to multivitamins and minerals. Drugs.com: An overview of multivitamins and minerals. LA Times: An article about "his" and "hers" multivitamins.